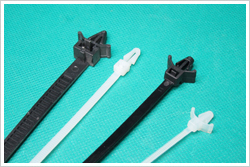 Push mount cable ties are idea for dependable holding and fastening of wire and cable. Push mount head design can simply clip a Cable Tie onto a panel without the need for an additional fixing. Three styles of mounting head available for different application. The Wing Push Mount Cable tie features a triangular shaped head that can be pushed into a pre-drilled hole to secure the bundled harness in place. The wing is flexible that can fix the anchor firm. The Barb Push Mount Cable tie features a triangular shaped head that can be pushed into a pre-drilled hole to secure the bundled harness in place. The Barb Push Mount Cable tie features a triangular shaped head that can be pushed into a pre-drilled hole to secure the bundled harness in place. It’s special could easy release for temporary use.